Search for the best flight prices from Stansted to Izmir. Compare prices, book today and save money with Stansted Airport. Without doubt one of Turkey’s most lavishly cosmopolitan cities, Izmir is regarded as the gateway to the Aegean coast, making it exceptionally popular for all the right reasons. Hotels range in price and quality from the exceptional and expensive to the quant but charming, while the local selection of restaurants offer some irresistible fresh-caught seafood dishes. Truly a city by the sea, Izmir has thrived by its position, allowing visitors to enjoy beautiful sea views from any one of the sea-fronts many cafes and bars, before taking to the labyrinth-like Bazaar to find anything from toys and trinkets to lovingly created Persian rugs. The labyrinth alleyways of Izmir's Bazaar Area make for super local market shopping. You'll find everything from cheap plastic bowls and clothing to beautiful Turkish carpets, colourful glass lamps, and copperware. Even if you're not a shopper it's a great place for people watching. For a more sedate shopping experience, head to Dösim (Cumhuriyet Bulvar 115) right on the waterfront. This store has a good-quality selection of handicrafts at fixed prices. If you're looking for clothes, Konak Pier Shopping Centre (Konak Pier) is Izmir's premier mall. 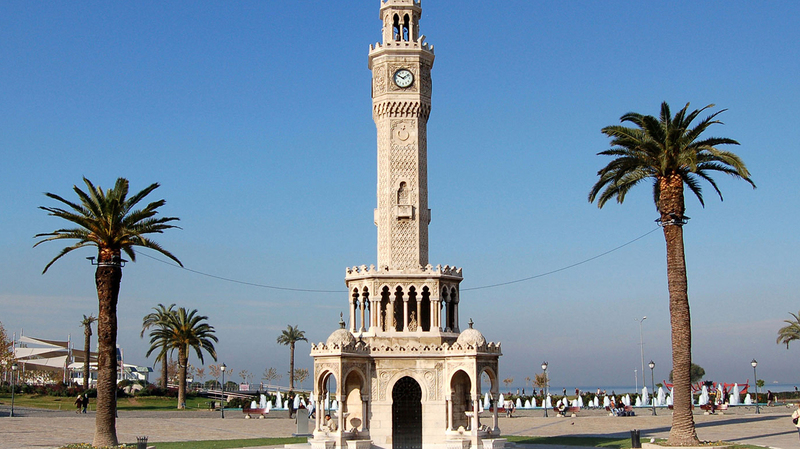 Izmir is defined by its seafront and if it's seafood you're after, you're in the right place. Deniz (Atatürk Caddesi 188) is the most famous top-end seafood restaurant in the city; dress to impress to dine here. More down to earth but no less delicious is Sakz (eht Nevresbey Bulvar 9) with a menu that fuses traditional Turkish staples with modern twists. For a cheap and filling feed, hike up the hill to Krm Ci Börek (Birlemis Milletler Caddesi). There are plenty of cafés and bars along the seafront serving alcohol as well as coffee. Alinda Cafe Bar and Cafe Melanie on Atatürk Caddesi are both popular places to chill out with a beer. Enjoy this 15-day celebration of all things jazz, which attracts both renowned artists and newcomers at various venues around the city. This festival stretches out beyond the perimeter of the city to traverse the wider region, attracting well-known international artists and local musicians and dancers. Izmir's biggest annual festival runs for a month and puts on everything from rock concerts to opera. Izmir's spacious Kültürpark hosts Turkey’s oldest trade show each year, attracting exhibitors not just from within the country but from around the globe. International and local directors combine to put on a variety of drama, documentary, animated and experimental short films. Visitors can check out the Q&A sessions in addition to the screenings. Enjoy two days of blues performances which are part of a nationwide festival that tours Turkey’s major cities.